Long time between write ups but im thankful to being so busy with regular clients over the last month. Its great to see and hear of regular clients arriving at this time of year and planning their dates around times in which I think the rivers should be at their best. As predicated the best runs were seen on the Hine and smaller rivers early in the season but now all the excitement has switched to the mighty Tongariro and should continue late into the year, it is the same every year. Â I have picked up clients from all over Turangi lately including many holiday homes but also some first class accommodators such as the Sportsman’s Lodge, Creel and Turangi Trout Lodge, all these places have made my clients very welcome and gone above and beyond being just somewhere to sleep- totally recommend them. 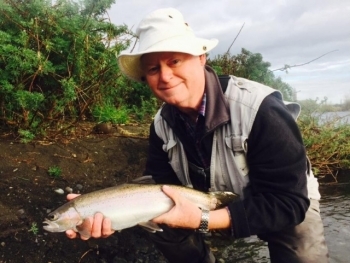 Our little batch has been busy with the usual suspects, Derek fished every day last week and enjoyed the Tongariro once again but also stopping in and hooking the odd fish in the Hine on his way home. 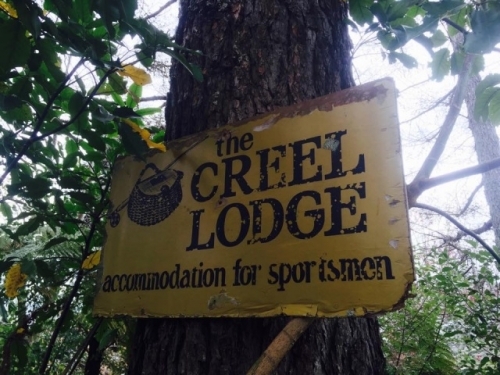 Ian, Marcus, Phil, Stuart, Calvin, Joe,Â Allan and John you have all made this month a fun time to be on the water and im sure we will see you all again next year. 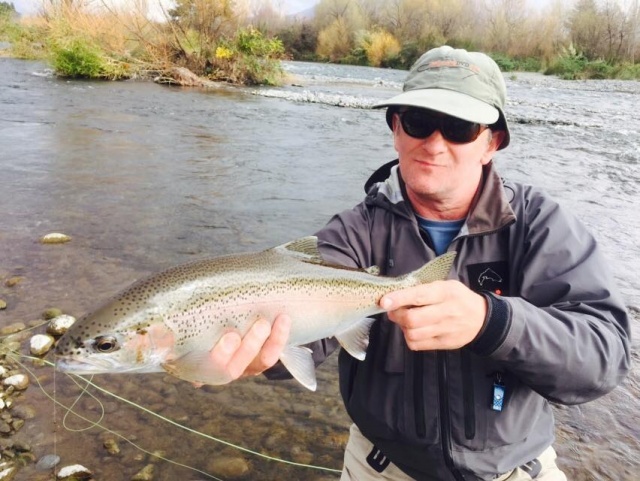 I wont speak of each and every time I have been on the river but in general the fishing on the Tongariro has been very consistent and productive both using nymphing methods but also wet lining rabbit flies. The majority of my time has been spent in the lower river but when fishing high it at times has been just as good. 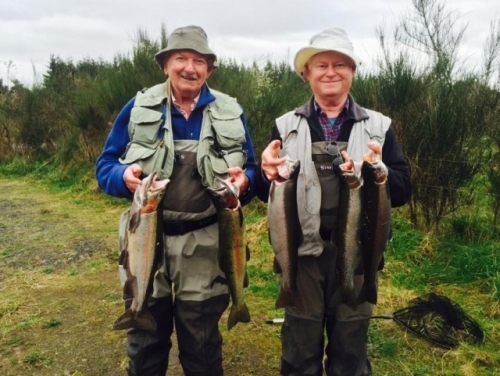 Fish seem to be in pretty solid condition but the size may be down currently, plenty of fish in the 2-3 lb range. 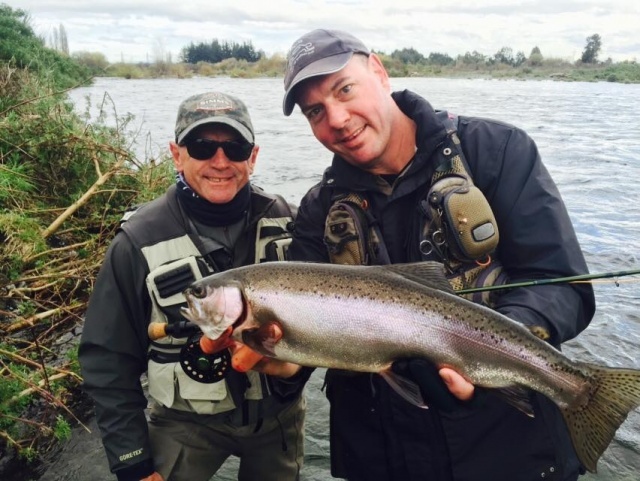 Angling can be described as hectic some days and some areas have been very busy with anglers but that’s what the Tongariro can be about, I quite enjoy fishing with others it gives you a good idea of what is happening in the area. Trout this year seem to be running all day and not deterred by fisherman or bright skies. I have seen on multiple occasions everyone having quiet fishing then all of a sudden every angler hooked up- this is fish moving into the pool! Keep a sharp eye on the water when this is happening and you will see the odd fish rising through the currents, you should be in! I had a fish takeÂ a clients strike indicator last week, a sizable orange and yellow piece of yarn, was this taken as a floating glo bug or just out of aggression?? With spring here and longer nights there has been the odd rising fishing swirling about in the slower pools, dry fly may be close??!! More and more annual angling trips are being based around the later fish running into the Tongariro and over the last couple of weekends I have seen and heard of groups with their in house comps and events based on fishing locally. This certainly adds a few anglers to the popular pieces of water Â but most are in fine spirits and happy moving about with everyone else on the water. Is getting up early worth it ?? I have been guiding by 7 am most mornings , is this early or late?? Some fisherman may have been waiting for day light since 5 30am and IÂ will certainly never beat them on the water but I don’t think its a deal breaker currently. I have had just as good fishing at 11 am lately as I have had at 7 am, fish are moving during the day quite well. This is not to say the fishing is great 24/7 after 5 solid days of good fishing we hit a dry patch with hard fishing on Sunday. 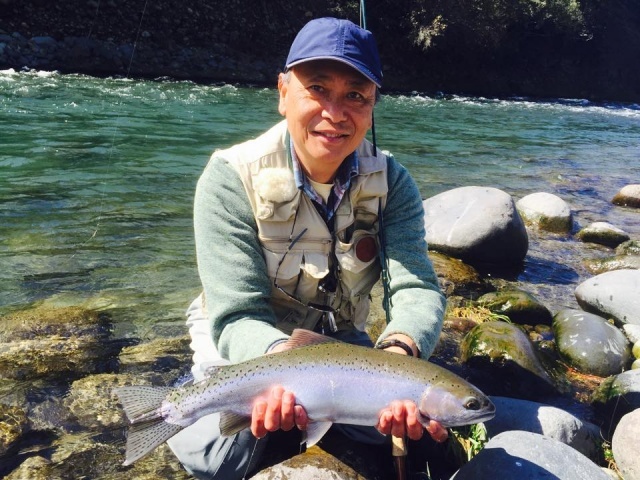 After spending the morning on the Tongariro we fished the Hine for a change of scenery and did quite well with darker mending trout. Have your licences on you as the rangers are surveying and checking permits which is good. My client for example has done 3 trips in four months over winter and we have been pulled up 3 times , which is wonderful. Most of us should have a nice little card now to stick in our jackets or wader pockets, I think its been a good move. Over the past few weeks we have seen a bit of a trend when catching hen fish or jack fish. The hens seem to be collecting natural patterns such as quasimodos, hare and coppers, caddis etc really well and the jack fish are favouring to take the glo bug better. I have been using more natural patterns lately as I figure they see these all the time and should grab them if they are presented well enough. Presentation, drag free, leader length and correctly weighted are all thingsÂ that jump to mind when explaining to anglers how to achieve best results. Wet lining has been a lot of fun this year, Tongariro has some great water for this method. With plenty of silver bullets running the river swinging rabbit patterns are a sure thing if done right. I use a very fast sinking line and keep that rabbit on the move , even on the swing. Fishing your wet fly with speed will entice angry strikes and hard pulling fights. 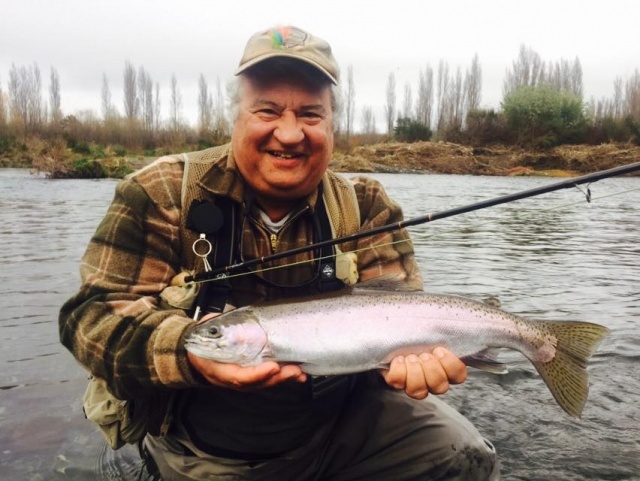 I think you will find wet liners may catch the better fish generally, wet lining doesn’t attract slabby fish as they simply wont chase down that fly in fast water. Today -Wednesday, was a pleasure as I was once fishing with my good old friend John and his partner in fishing Allan from Sydney. I guided John maybe 5 years ago now and he is a regular client when heÂ is in town these days on their annual or two yearly trip. John is now 75 years young and is a great fisherman and Allan certainly holds his own but is still learning a lot from John which has fished a lot of water over the years. Staying at Tongariro River Motel I had them meet me at the coffee cart at a leisurely time of 7 am for a hot drink before hitting the river for the morning. Unfortunately luck had not been on their side for some reason and they had fished all day on Tuesday for nothing , not even a hook up so I was keen to get them going asap a something must have gone wrong, its the Tonagriro after all. We headedÂ down river and after a bit adjusting to the nymphing rig and getting them in the main lies they both had aÂ 4lb silver bullet secured on the bank. We moved about, switched nymphs around, changed weights and most of all just caught up on old times which is a huge part of my guiding that I enjoy. We pulled stumps at lunchtime and had a brew together on the river and reflected on what had been a very enjoyable and productive morning on the river hooking 18 fish and both anglers killing their limits for the smoker. You are an amazing man John, I hope at 75 im as fit , strong and smart as you mate, best of luck for the rest of the week eh.